Does a Soy Mordant work? Does a Soy Mordant create a more colorfast dye? Does a Soy Mordant create deeper colors? The idea of a soy mordant came to my practice from a few natural dyers I follow on social media and my biggest influence was a (new to me) book - Botanical Colour at Your Fingertips by Rebecca Desnos. It was a quick read, about 100 pages. I purchased my book from Amazon. 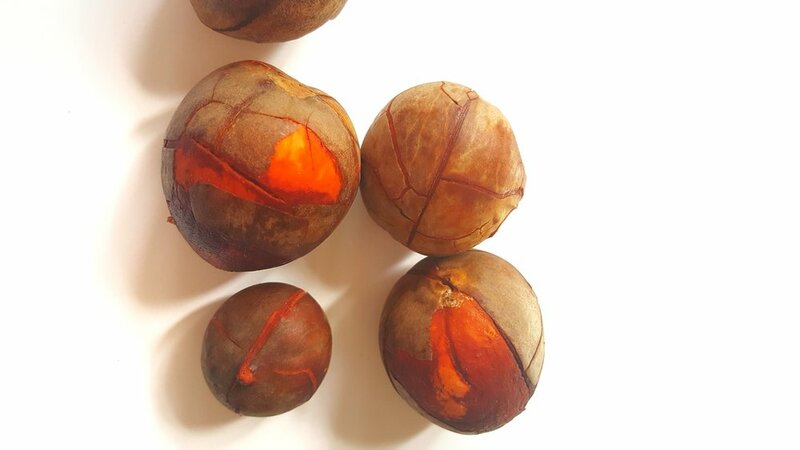 Avocado pits, the dye I'll be using with the soy mordant, have tannins which is a natural mordant. Technically, you do not have to use another but I have done avocado pits solo in the past and wanted to see what might happen by adding the soy mordant. According to the instructions in the book; the longer you wait for the soy proteins to bond to the fibers of the fabric the better mordant and fix you get. The deeper the color etc. The book recommends waiting at least a week before dyeing with the soy mordant-ed fabric. That afternoon I tossed in a double gauze sample pre-soaked with soy mordant into the prepared dye. The sample sat for about 4 hours. I proceeded to remove it rinsed and hung dry. By this time I felt like I should throw the opposite non-mordant-ed sample in over night (since I was heading to bed) just to see what happened. The next morning I woke up and took the lid off the pot.... it smelled like spoiled milk. Thankfully and for really no reason, I had set the pits aside the night before. 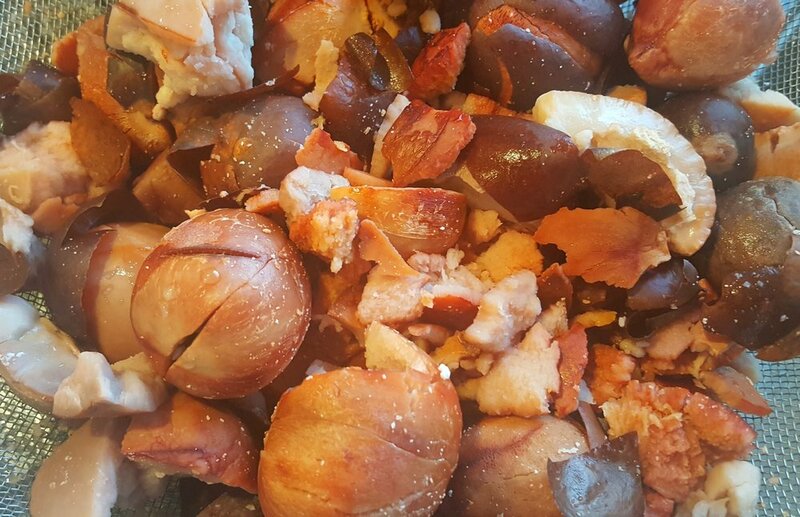 I threw in the old pits and reboiled. The smell went away but the dye still looked like it had soy in it from the first dye batch, as it was not as clear as a normal. In Rebecca's book the directions specifically say to run your fabric through the washing machine after mordant-ing. I didn't do this. I rinsed, hand washed and hung dry after letting the soy sit on the fabric longer as explained above. I didn't want soy milk in my washing machine but apparently it's a good idea to not skip this step. I've come to the obvious conclusion that I missed some soy milk in my washing method. Lesson learned. Does Soy create a more colorfast dye? TBD // I am not completely sure as I have not yet tested it. I do plan on creating garments with soy mordant-ed fabric so I can report back on how the dye holds up over time along with information on normal wash and wear. 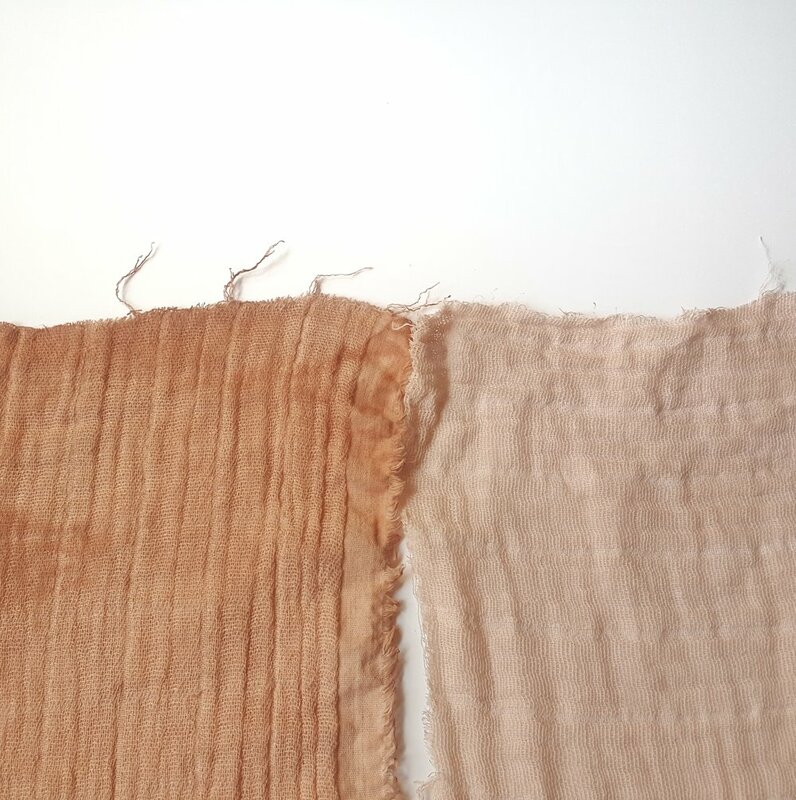 YES // in this experiment I can definitely see a huge color difference between the soy mordant-ed fabric and the non- mordant- ed fabric which uses only the natural tannins in the avocado pit. Proof of a deeper color with the soy mordant can be seen in the photo below.